Several car manufacturers offer built-in Qi wireless chargers that are compatible with the iPhone 8, iPhone 8 Plus, and the iPhone X, and Apple this evening published a new support document highlighting vehicles that support the feature. According to Apple, Audi, BMW, Chrysler, Ford, Honda, Mercedes-Benz, PSA, Toyota, Volkswagen, Volvo offer Qi-based wireless charging options that work with the iPhone 8 and "might work with the iPhone 8 Plus." Apple can't say for sure that the iPhone 8 Plus is compatible with these vehicles because some wireless chargers have physical size constraints that might not fit every phone. Apple also lists several specific 2018 vehicle models from Buick, Cadillac, Chevrolet, and GMC that offer wireless charging that's compatible with both the iPhone 8 and the iPhone 8 Plus, though the same size caveat applies. Wireless charging in 2017 and earlier models from Buick, Cadillac, Chevrolet, and GMC does not meet the requirements for Qi certification and thus will not work with the iPhone 8 and iPhone 8 Plus. Apple's support document does not yet mention the soon-to-be released iPhone X, but it features the same Qi-based wireless charging functionality that's in the iPhone 8 and the iPhone 8 Plus. The iPhone X is larger than the iPhone 8 but smaller than the iPhone 8 Plus and thus may also not be compatible with all in-car wireless chargers due to size limitations. Before purchasing a vehicle with a Qi-based wireless charging feature, Apple recommends customers make sure that their iPhones will fit in the charger first. Do these and upcoming cars also have wireless CarPlay? If not, then it doesn't really matter that much, since you'll want to plug it in anyway. When’s wireless CarPlay getting rolled out by VW and others? That’s the right question. Wireless charging makes no sense if you do not have wireless carplay. But current car owners won’t care since car manufacturers aren’t exactly known for their upgradeability. People wanted a universal charging “port”. Voilá. Qi is about to explode. It’ll be absolutely everywhere in under 2 years. Cars, hotels, coffee shops, restaurant tables, office furniture. Anywhere you sit down for a bit, you’ll just lay down your phone and top up through the day. Empty batteries are going to become a thing of the past. Hopefully AirPower lives up to its name and actually works through the air. That’ll explain why it’s not yet ready to be rolled out. 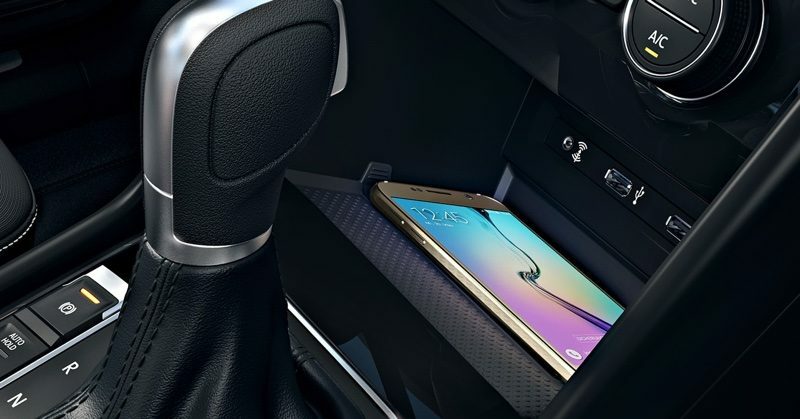 *Some automotive wireless chargers have physical size constraints and might not fit every phone. If you're planning on buying a car with a wireless charger, make sure that your iPhone will fit in the charger first. My 2018 Hyundai Elantra GT has qi apparently. My iPhone 6 fits with at least a few cm of space with a case. Would think the x will fit for sure. For anyone curious about the new Honda Accord I can confirm it worked in a 2018 Touring I checked out the other day. The salesman said I was the first person to try the feature. According to Apple, Audi, BMW, Chrysler, Ford, Honda, Mercedes-Benz, PSA, Toyota, Volkswagen, Volvo offer Qi-based wireless charging options that work with the iPhone 8 and "might work with the iPhone 8 Plus.